After losing her parents in a car accident, Okko goes to live in the countryside with her grandmother, who runs a traditional Japanese inn built on top of an ancient spring said to have healing waters. While she goes about her chores and prepares to become the inn's next caretaker, Okko discovers there are ghosts who live there that only she can see – not scary ghosts, but playful child ghosts who keep her company and help her feel less lonely. A sign outside says the spring welcomes all and will reject none, and this is soon put to the test as a string of new guests challenge Okko's ability to be a gracious host. But ultimately Okko discovers that dedicating herself to the happiness of others becomes the key to taking care of herself. 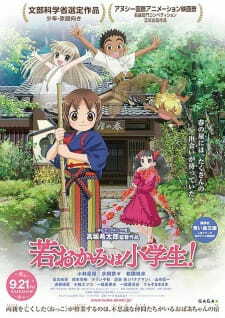 The theatrical version of Wakaokami wa Shougakusei! features different production team and supporting cast members from the television series version. It made its world premiere at the 2018 Annecy International Animated Film Festival before opening in theaters in France a few months later on September 12, one week before the Japanese theatrical release. Alternative version: Wakaokami wa Shougakusei!